This thriving, quintessentially English seaside town has all the ingredients for a fabulous family holiday. Make the most of the long weekend and treat yourself to a cottage break on the Suffolk Coast. A charming, bygone village wrapped in coastal beauty. Heavenly beach, pubs a plenty. Thorpeness, Aldeburgh & Surrounding Villages. "Sea, sand and so much more. After a long beach walk and a visit to Harris and James for some of the best ice cream ever, we would head back to the comfort of our cottage courteous of Suffolk Secrets, close to the sea, town, inns and hotels. We return in April to rediscover it all again"! What leaves 24 million footprints, uncovers hidden treasures and touches every corner of Suffolk every May? The Suffolk Walking Festival does! A quiet village on The Suffolk Coast, which has been known to attract celebrities, Walberswick is a delightful spot with great pubs, excellent crabbing and a gorgeous, dune-backed beach. If you’ve always thought about changing things up and embarking on a staycation but never taken the plunge, then look no further than our great reasons to holiday in the UK. When visiting Suffolk, Orford should most certainly be high on the list as a place to visit or a place to stay. Aldeburgh is one of the Suffolk Coast’s most popular seaside towns. Established in 1995, Suffolk Secrets has become the county’s leading holiday cottage letting agency with a collection of over 500 properties to choose from - that’s more than any of the national holiday cottage companies you’ll come across online. All of our holiday homes are regularly quality assessed too, so you can book with us, safe in the knowledge that your accommodation will be good quality (we only represent holiday homes that are graded 3 stars or above). We’re a local team, which is great for you. Between us we’ve walked along pretty much most of the Suffolk Coast, explored acres of countryside, eaten in lots of wonderful places from pretty tea rooms to fine restaurants, and taken our children and grandchildren on countless days out across Suffolk. As well as knowing our properties, we can tell you thing or two about our wonderful county - just ask. We have offices in Southwold and Aldeburgh where you can pop in and see us during your stay, or you can call us 7 days a week. We know how important it is to get your holiday right. Let’s face it - time is precious and we need to spend as much of it enjoying ourselves as possible. As well as providing you with the best choice of holiday cottages out there, we also like to keep you informed about the best things to do whilst you’re in Suffolk, the places you just have to see, and the events that are taking place. Our area guides are a great starting place to find out more about your holiday location. You can also take a look at our holiday blog, the What’s On pages and the Places of Interest page to really make the most of your Suffolk cottage holiday. Where to stay in Suffolk? So, you decided to come to Suffolk, but what’s your best location? Well, if you’re searching for a traditional seaside holiday, a holiday cottage in or around Southwold could be just what you need. We have over 200 properties in the Southwold area, from chic urban apartments overlooking the High Street to luxurious townhouses with stunning sea views, and everything in between. For a more tranquil coastal stay, choose from one of the many pretty villages scattered along the Suffolk Coast. Walberswick is a charming village and was once home to the ‘World Crabbing Championships’! With Southwold just a rowboat ferry ride across the river, this place has it all. Book a cottage in Dunwich and learn about this historic ‘lost city’, or if you love nature, Westleton and Middleton are a short drive from RSPB Minsmere, which you may know from BBC Springwatch. For a coastal break with a splash of culture, Aldeburgh should be your first choice. A charming coastal town with the delightful village of Thorpeness within walking distance and world famous Snape Maltings a short drive away, Aldeburgh has a wonderful stony beach, plenty of art galleries, it’s very own cinema and some of the best fish and chips around! Take your pick from around 150-holiday cottages in Aldeburgh. If you’re travelling to Suffolk by train (or yacht!) Woodbridge is the place for you. Easily accessible from London and on the banks of the River Deben this delightful town has wonderful waterside walks, a charming High Street and restaurants galore. With an annual ‘Shuck’ festival to celebrate the produce from the river, in particular, oysters, a holiday in Woodbridge is perfect for food lovers. Of course, the joy of a self-catering holiday cottage is your dog can come too! We have a fabulous selection of pet and dog-friendly holiday cottages - over 240 of them in fact. Suffolk is a wonderful holiday destination for a dog! There are some wonderful walks, traversing a mix of landscape - breathtaking coastline, stunning heathland, woodland and more. Many of the beaches are dog-friendly, as are lots of pubs, cafes and restaurants. If you fancy adding a touch of luxury to your Suffolk cottage holiday or an experience you just can’t get anywhere else, why not add some Holiday Extras. We’ve teamed up with a collection of national and local partners to bring you some fabulous ‘add-ons’ from beauty treatments in the comfort of your holiday home or a private chef to come and cook you dinner, to classic sports car hire or private art classes. 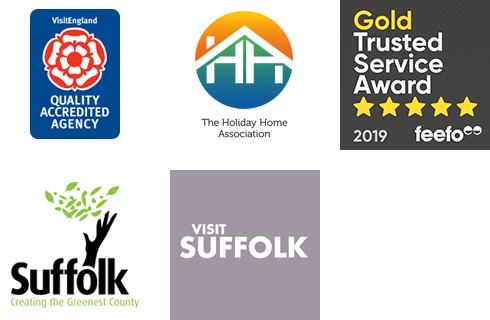 As the largest holiday cottage letting agency in Suffolk, we have a duty of care to look after all the things that make Suffolk such a wonderful place for visitors and residents alike. We are proud to work with the Suffolk Coast and Heaths Area of Outstanding Natural Beauty and have our very own fund to support local projects that nurture and protect our landscape. We ask each of our customers for a £1 voluntary donation to support these projects to help keep Suffolk special, we hope you don’t mind. Suffolk Secrets is one of a family of local brands owned by the Original Cottage Company. If you feel like browsing further afield, why not take a look at our national website originalcottages.co.uk where all of the properties listed with our sister local brands are available to book in one place. We’re sure you’ll find your perfect Suffolk holiday cottage here on our website, but if you need some advice please don’t hesitate to call us on 01502 722717 - our friendly holiday advisors are here to help and waiting for your call.